"Our message to those who are . . . contemplating coming here illegally: We will send you back. . . . People in Central America should see and will see that if they make this journey and spend several thousand dollars to do that, we will send them back and they will have wasted their money". Jeh Johnson, Secretary of Homeland Security, June 27, 2014 (CNN 2014). "The question is if you don't want to have to go through this problem, don't come unlawfully," Sessions said Wednesday, stating that it was his intention to "send a message" to immigrants seeking refuge in the U.S (Newsweek, May 2018). As the above quotes makes clear, at least since the 1980s U.S. officials from both sides of the aisle have attempted to send a message to individuals considering immigration to the U.S. via the country's southwestern border that they will not succeed. In addition to conveying this message directly to citizens of northern Central American countries through in-country public media campaigns such as the 2014 "Dangers Awareness" campaign and the 2015 "Know the Facts" campaign, the preferred means of deterrence of future immigrants has been, and continues to be, detention, expedited deportation and, often, denial of rights to present-day border arrivals. The recent efforts by the Trump Administration to toughen the process of making an asylum claim represent merely another step in these decades-old efforts to convince Central Americans in particular that attempts to immigrate to the U.S. are simply not worth it and will not succeed. 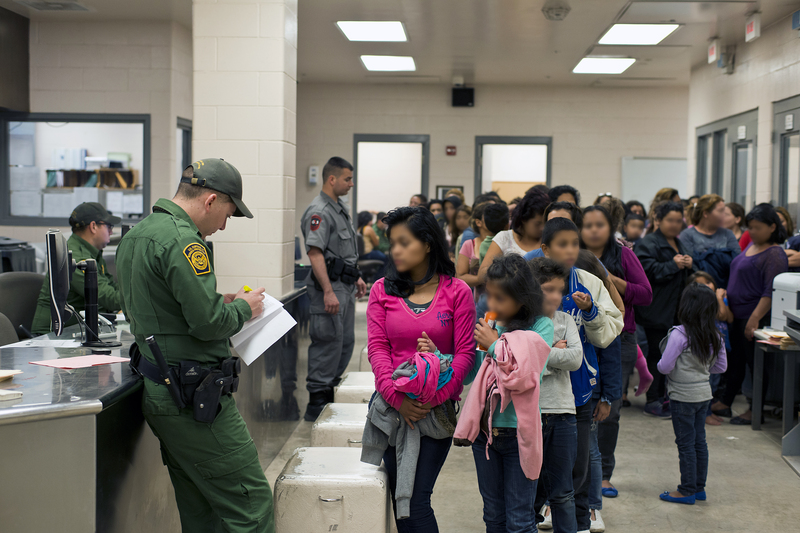 Notwithstanding the widespread reliance on this strategy to deter future migrants by toughening present-day immigration laws and border enforcement, it does not seem to be working as the numbers of Central Americans arriving at the border remain high. Indeed, from the time the Obama Administration launched its crackdown on Central Americans arriving in the summer of 2014 to the most recent "zero tolerance" policy of the Trump Administration, again targeted primarily at those arriving from northern Central America, apprehensions of Mexicans at the border has dropped to levels not seen since the 1970s while apprehensions of "non-Mexicans" (i.e. Central Americans) continue to be the highest in years. Though such deterrence campaigns may have had their intended effect on those individuals considering immigration for largely economic reasons, we contend in our forthcoming piece in the Latin American Research Review that the U.S. deterrence strategy does not work for the growing subset of individuals from northern Central America who are fleeing high levels of violence in countries where governments are unable to keep them safe. In short, the push factors of crime, violence, and flawed governments are far more powerful than any shifts in U.S. policy with respect to what happens to an individual upon arriving at the border. On what do we base these conclusions? In analyses of data from multiple surveys conducted by Vanderbilt University's Latin American Public Opinion Project in the spring and summer of 2014, we find strong and consistent support for the notion that crime and violence have played a far more important role in the emigration decision for individuals living in Honduras and El Salvador, two of the most violent countries in the world, overshadowing the impact of economic factors. Moreover, we find that, even though large majorities of individuals with emigration intentions report that they are acutely aware of changes in U.S. immigration policy and the increased peril of the journey north, many of them still consider emigration as preferable to the dangers of staying home. In order to understand the role that crime victimization played in the emigration intentions of individuals living in the northern Central American countries of Guatemala, El Salvador, and Honduras, we first modeled such intentions as functions of the standard predictors of emigration such as gender, age, income, perceptions of the economy, along with whether or not an individual had been victimized by crime in the previous twelve months. In Guatemala, as has been found in many other countries, we find the respondent most likely to report considering emigration to be very similar to a typical economic emigrant - young, male, unemployed, and an individual who receives financial support from a migrant. In El Salvador and Honduras, however, very few of these factors were significant. Rather, the most powerful predictor of a respondent's emigration intentions was whether or not she had been victimized by crime in the previous twelve months. Perhaps not surprisingly, emigration intentions were particularly likely among individuals who had been victimized by crime multiple times in the previous year. For Salvadorans, the probability of reporting emigration intentions increased over ten percentage points when comparing victims with non-victims, while for Hondurans, the probability jumped from 30.8 to 46.3 when moving from non-victims to those respondents victimized by crime more than once (see Figure 1). In short, we find overwhelming evidence that the nature of emigration from these two countries in recent years is fundamentally distinct from the standard economic migrant narrative that has been used to describe those arriving at the U.S. border from Mexico and Central America over the past thirty years. While the emigration decision is never based on a single factor, the role of crime and violence appears to be decisive for those individuals both the Obama and Trump administrations have been trying to deter in recent years. Our second objective in this study was to try to discern the impact of the U.S. deterrence strategy on individuals living in high violence contexts in Central America. We turned, then, to a second survey carried out by LAPOP in late July and early August of 2014, precisely at the height of the Obama administration's efforts to "send a message" to Central Americans to stay home. Indeed, at the time this particular survey went into the field, the "Dangers Awareness" campaign, a multi-million dollar media blitz throughout Central America on television, radio, and billboards, had been underway for two months. Not surprisingly then, we found in this survey of over 3,000 respondents living in twelve municipalities in Honduras, that close to 80% thought that deportations in the U.S. had increased, 84% thought crossing the border was less safe, and over 85% thought crossing the border was more difficult than in August 2013 (see Figure 2). From these results, it seems clear that the U.S. efforts to make Central Americans aware of the hardening of U.S. border policy and the low probability of successfully immigrating to the U.S. had its intended effect – an overwhelming majority of our respondents knew full well that the decision to leave for the U.S. in August of 2014 was fraught with danger and had a very low chance of success. The question, however, is whether or not this message had its intended effect? The short answer we arrive at is a resounding "No." In repeated multivariate analyses of emigration intentions among these respondents, in no instance did any of these perceptions of the U.S. immigration climate reduce the likelihood that an individual reported intentions to emigrate. Once again, the most powerful predictor of such intentions, even after controlling for perceptions of the risks and chances of success, along with a host of other relevant variables, was crime victimization. No matter how accurate and well-informed an individual's perception of U.S. immigration policy was, the question of whether or not she was considering emigrating hinged on her direct experiences with the crime and violence that have plagued Honduras in recent years. Specifically, for individuals living in high crime contexts in Honduras, the probability jumped by 18 points when moving from non-victims (19.5) to those victimized multiple times (37.6). In sum, they were simply trying to leave the devil they know, no matter how bad the one they don't may be. The toughening of immigration laws, greater migration dangers, and increased awareness of those dangers may deter economic migrants but not those fleeing for their lives. Knowledge of this "selection effect" currently at work among those choosing to leave El Salvador and Honduras for the U.S. makes the current deterrence efforts on the part of the U.S. all the more egregious as the rapid deportation and denial of asylum claims increases the chances that those individuals being returned to their home countries are even more likely to face a life-threatening situation upon return. In other words, such a strategy, aimed specifically at those likely to have the most credible claims for asylum, would seem to place the U.S. in direct violation of the non-refoulement principle of international and domestic refugee law – the principle that prohibits a signatory state from returning individuals seeking asylum to their country of origin if such actions place them in danger of persecution. Rather than such expedited removal efforts, then, our analysis suggests that a U.S. strategy that places far greater attention on providing due process and adequate legal representation to those border arrivals deemed to have credible fears of persecution, along with continued assistance in addressing the root causes of those fears across northern Central America, will ultimately have a greater chance of success than a strategy based on deterrence. Hiskey, Córdova, Malone & Orces (2018) Leaving the Devil They Know: Violence, Migration, and U.S. Policy in Central America. Latin American Research Review, 53 (3), Forthcoming. is an associate professor of political science at Vanderbilt University. In addition to his work on the role crime and insecurity play in the emigration decision, Hiskey's recent research also explores the political and development implications of migration for sending communities in Latin America, and the role migrants play in those processes. His research on these issues has appeared in such outlets as Comparative Political Studies, Studies in Comparative International Development, and the Annals of the American Academy of Political and Social Science. is an associate professor in the Department of Political Science at the University of Kentucky, and the 2016-17 Central American Visiting Scholar of the David Rockefeller Center for Latin American Studies (DRCLAS) at Harvard University. She studies the political impact of inequality and marginalization in the Latin American context. Her research agenda integrates topics related to economic inequality, gender inequality, crime and violence, and international migration. Her research has been published or is forthcoming in peer-reviewed journals, including Latin American Research Review, Journal of Politics, World Politics, Comparative Political Studies, and Latin American Politics and Society. is an associate professor in the department of political science at the University of New Hampshire. Her work focuses on the current crime epidemic in Latin America, and its implications for democratic governance. Her book, The Rule of Law in Central America: Citizens' Reactions to Crime and Punishment, examines the impact of the crime wave on citizens' political attitudes and behavior. Prof. Malone's publications have appeared in Latin American Politics and Society, The Latin Americanist, and the Journal of Politics in Latin America. Is a Research Analyst at the American Immigration Council (AIC) in Washington, DC. She received her Ph.D. in Political Science from Vanderbilt University. Her recent work focuses on understanding receiving communities and immigration detention in the U.S. She has published in such journals as The Annals of the American Academy of Political and Social Science, Latin American Politics and Society and Studies in Comparative International Development.